Do You Need Professional Help with Your Basement? Has your basement become a source of worry over the years? Have you noticed water or high moisture content in your basement? Are you aware of the fact that weak or wet basements can actually cost you your home? Foundation repair and bowed basement walls – here is what you need to know! Basement wall foundations are the most important element of a stable home. However, often foundations fall victim to a number of factors and become weak and troublesome. Foundation walls and basement floors crack and bow due to external pressure soil pressure and seasonal changes. In many areas like Georgia, where the soil is damp in nature and the climate is moisture-laden, it is evident that Georgia homeowners are constantly troubled with wet basements and cracked or bowed walls. 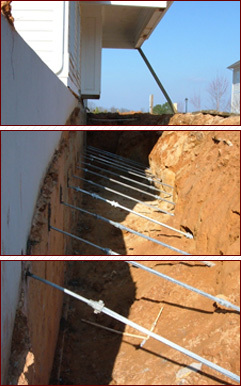 With the hydrostatic pressure and expansive soil issues, foundations in Georgia homes weaken considerably over time. To counter these problems, many homeowners rebuild the damaged walls or floors of their foundation, or rebuild the entire basement. However, there are more effective and affordable options available to homeowners in Georgia today. At Atlas Piers of Atlanta, we take pride in providing you a cost-effective and financially feasible solution for fortifying your basement. We provide quality, long-term solutions that are advised by the most experienced and skilled basement repair experts and engineers in the country today! Carbon Fiber Reinforcement – We use Stronghold brand carbon fiber reinforcing strips. These strips epoxy to the surface of your wall to prevent further bowing and cracking. The strips can be used when the wall is bowing less than 2” from plumb. This installation is done within one-two days, with the help of our team of basement foundation repair professionals. Helical Tiebacks – Heavy steel anchors are screwed into the ground and then attached to a heavy steel plate on the inside of basement walls. This installation is done within a couple of days, with the help of our team of basement repair professionals. Push Piers – Robust heavy steel piers are hydraulically driven down to the load-bearing soil with high-pressure hydraulic equipment. Each pier is individually load tested to assure long term support of your basement walls. With all piers installed below ground level, the external beauty of your home is also left untouched. This installation is done within a few days, with the help of our team of basement repair professionals. We install all these foundation repair systems at any time of the year anywhere in Georgia! Some of the cities that we serve are Atlanta, Roswell, Marietta, Sandy Springs and many others. So what are you waiting for? Call us for a free estimate today at 770-740-0400! Seasonal changes may cause problems with your homes foundation. Hydrostatic pressure or puddles of water may cause bowed, buckled or cracked basement walls. Rebuilding of the wall is not always necessary and generally d doesn’t solve the problem but installing anchors and/or piers, along with solving drainage issues, can lead to long term success. Generally, installation is complete in a couple of days by our trained basement repair professionals without long term disturbance of landscaping. All anchors and piers are manufactured by Earth Contact Products from high quality steel and are hot dip galvanized for long life. The system is designed and engineered to develop holding strength several times the strength of a basement wall.